Just two years after opening for business in Santa Fe, New Mexico (named Travel & Leisure’s 2011 Top Cultural Getaway city), locally owned Pizza Centro’s hand-tossed pies have earned a solid reputation as Santa Fe’s best pizzas. The destination’s only New York style pizzeria, Pizza Centro’s menu is made fresh daily with handcrafted dough, house-made marinara sauce, and quality ingredients in creative combinations. Owner Nathan Aufrichtig has studied under top pizza chefs in New York City and New England. He is also an artist. Co-owner Jason Aufrichtig trained at The New School and New York Restaurant School in Manhattan, and also owns Santa Fe’s popular Counter Culture Cafe. 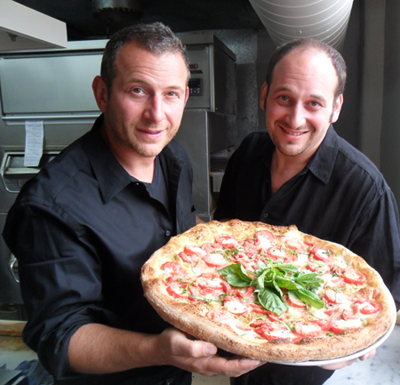 The two brothers collaborate on Pizza Centro’s unique combinations of specialty ingredients on their pies, and memorable house- made salad dressings. Top-selling options include: the Hell’s Kitchen, with sausage, flash-fried eggplant, jalapeno, roasted red pepper, feta, marinara, whole milk mozzarella, and a nod to New Mexico green chile; and the Soho, with roasted chicken, mushroom, sun-dried tomato, onion, truffle oil, and fresh basil, also finished with marinara and whole milk mozzarella. Like these two customer favorites, all the restaurant’s specialty selections―including flavorful vegetarian options Central Park and Alphabet City―are namesakes of various New York neighborhoods. Also on offer are slices, sandwiches, calzones, salads, cannoli, beer, and wine.